Are you a Dublin based Childcare Provider? Join Parenting Expert Val Mullally (Author of ‘BEHAVE – What To Do When Your Child Won’t’) for a FREE seminar (over two Thursday afternoons, 11th & 18th August) hosted by Dublin Childcare Committee. Book your place now! Parenting expert Val Mullally has new blog released on My Kidstime: 7 more Useful Tips to Build Self Esteem in Your Child In this blog Val reveals the second key to Self Esteem and what parents can do to develop children’s sense of Connection. Make the most of your garden this summer and autumn. For simple, inexpensive ideas on creating fabulous fun for your children in your own back yard, see this blog by Parenting Expert Val Mullally. Is your child happy playing? I mean really happy? When you watch your child’s playing do you sense an inner contentment? Do you remember that fabulous fun in the garden – to stand on a log, arms outstretched, with the breeze tugging your clothes and ruffling your hair? It’s crazy – it’s the simplest thing to re-experience that exhilarating childhood joy – and yet, as adults, we seldom do. It was a blustery, sunny afternoon when I visited the Garden Outdoor Pre-school in Ruthstown, Ballyfoyle near Kilkenny, owned by Bridget Dowling, whose passion for creating environments for children to thrive is evident. I was on a mini photo-shoot for a blog about young children and play, when I realized how peaceful I was feeling. I had arrived feeling happily expectant because of the good reports I had heard about this preschool, but I was surprised to notice the sense of stillness and relaxation that had settled upon me. It was environments like this, where we loved to play when we were kids. Mum (or Dad) said, ‘Go and play!’ and we disappeared into the backyard, finding whatever scraps and treasures we could for our adventures. We were police officers chasing rogues and robbers, princesses in palaces, pirates sailing the seven seas, or gangsters tearing through deserts. Our imaginative play took us wherever we fancied. We took these play opportunities for granted, but today, if we want our children to have the rich play experiences that we had, we probably need to deliberately construct gardens to ignite our children’s imaginations. It’s time to stop thinking in terms of the neat, urban well-manicured garden. It’s time to a focus on creating ‘magical’ place for children to play. Read on to discover Easy To Implement Ideas for your ‘new look’, child-friendly garden. ✓ Let an area of grass revert to meadow. (You can trim it back in Autumn, if needed). Cut a simple path through it. Use sections of log to create stepping stones. Plant a small copse of light shade trees, like birch and leave the grass to grow between the trees and shrubs. ✓ Let sound be part of your garden too.Have bird feeders and a shallow bird bath to encourage feathered friends. Hang a wind chime.Create an ‘instrument wall’ with old pots, pans and other implements or the children to create their own orchestra. ✓ A tarpaulin gives shade as well as creating sounds effects as the wind whistes through it and flaps its sides, adding to the music of the outdoors. ✓ Recycle! Old pots and other implements can make a fabulous outdoor ‘kitchen’. ✓ Watch out for all sorts of interesting junk. A ‘builder’s corner’ will give hours of play. ✓ Grow your own veg. Even small beds are an awesome experience for children to watch the miracle of growth. It’s amazing how children who don’t eat veg will eat what they’ve grow themselves! ✓ Grow a willow tent! Make some of the simple toys we had as kids. Butterfly nets can give hours of fun. ✓ Have the sand toys ready for play by adding hooks on a nearby wall. (Important to have a sturdy cover to protect the sand from being polluted when not in use). ✓ Create a table and stools with sections of log. ✓ A wooden coat-hanger and cup-hooks attached to a pole make a weighing scale,or a captain’s wheel, or … ! Involve your children in creating the garden. They’ll love it even more when they have a sense of ownership. Water play on a warm day is great fun, but always keep a watchful eye. Of course, you need to be watching for any health and safety hazards, but remember what they said that fairies don’t come out when grown ups are around. For your child to enjoy the ‘magic’ of the new garden, keep low profile, unless they invite you to join the play! If you’ve enjoyed this list you’ll probably also enjoy ‘How to Create a Child Friendly Garden’. To discover more about the Koemba Parenting approach buy your copy of ‘Behave – What To Do When Your Child Won’t’, available on Amazon in Kindle and paperback. Please do upload your photos and stories here, or on the Koemba Facebook page, so we can all get excited about the garden makeovers you create. New blog post today by Parenting Expert Val Mullally. The wails of a toddler in distress ricochets off the walls. I glance at the mother, who yanks her crying toddler by the arm, ignoring her wails. The toddler drags behind her, screaming her protest. The mother stops. Towering over the child she speaks sharply, wagging her finger in the child’s face. Then she marches on, with sobbing child in tow. We’ve all had parenting moments we’re not proud of. But what can help us do differently? 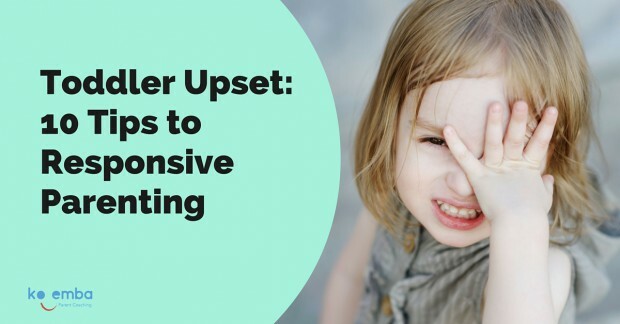 Here are some thoughts for stressed parents on what to do when your toddler acts out. We can handle a child’s challenging behaviour more helpfully when we have insights about how the human brain develops. 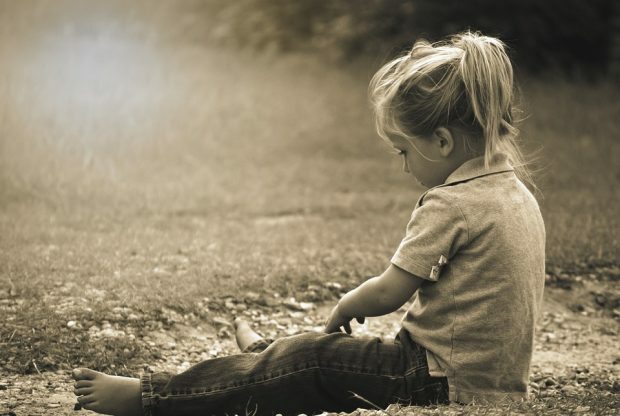 If you are facing a toddler upset here are ten tips for responsive parenting to calm your child and recreate connection. – a happier, healthier generation. This means the toddler cannot reason like an adult. She doesn’t have a concept of time. She doesn’t understand that you have deadlines to keep or chores to complete. Trying to explain your agenda to her when she’s demanding won’t help. Rather, focus on connecting with her. The ‘fight or flight’ part of her brain has now been triggered. She’s not reasoning – so trying to logically explain things to her is only likely to increase her frustration – and yours. First she needs your connection and sympathetic understanding. So let’s look at what a parent can do to calm an upset toddler. When she’s upset she’s trying to let you know she needs your support. At times when you child is most challenging tile is when she most probably most needs your love and support. At these times the young child is emotionally overwhelmed and needs your support to calm her down. Get down to her eye level and make eye contact (if she will) with a ‘soft gaze’.Your toddler physically can’t calm herself down when she’s upset – she can’t “self regulate”. Her immature nervous system relies on an adult to calm her. So if you choose to calm yourself, it will help to calm her. Your soft gaze will do far more to calm her than any amount of ‘reasoning’ words. There’s already one immature person having a meltdown. Your job is to remain the calm, collected adult who, rather than reacting, chooses to respond helpfully. When you steady your breathing your steady your thoughts.Remind yourself this is your young child who is distressed and needing support. If you have a key phrase that reminds you of the sort of parent you choose to be, say this to yourself: for example: ‘calm’, ‘being the adult’, ‘reassure’. Your steady breathing will also help to steady your child’s breathing. Your child senses your motivation far more strongly than she can hear the words you are using. (When you most want to say’ Listen to me’ is when she’s emotionally flooded and it’s impossible for her to listen! In upset times your child’s brain can’t make sense of your words. First she needs to connect with you. She will learn how to deal with stressful times by what you model. See life from her perspective. Reflect the same words/ energy / simple phrases that she does. Don’t try to stop the tears, just be compassionately present and ready to connect when your child is ready to do so.When we cry when we’re upset, the tears are chemically different to the tears we cry when we’re peeling an onion. Our ‘upset tears’ contain stress hormones. So having a ‘good cry’ / ‘crying it all out’ makes sense. Your young child is not out to make your life difficult – she’s doing the best she can. The bottom line is babies and toddlers need caring, connected parents, particularly in times of emotional stress. But how to be the calm, connected parent you want to be in times of stress? You can discover more with the three signpost to Mindful Parenting in my new Parenting book, ‘BEHAVE – What To Do When Your Child Won’t’. And if you’re a parent who is really keen to discover the practical tools to a more mindful way of Parenting, you’ll want to sign up now for start-when-good-for-you, return-as-often as-you-wish Online Parenting course. I recommend Margot Sunderland’s book ‘What Every Parent Needs to Know’. It’s the type of book that you’ll frequently dip into, with chapters on issues such as sleep and bedtimes, behaviour issues, crying and separation. It’s filled with a wealth of knowledge and practical advice, based on scientific fact, about what children need to thrive. You want your children to enjoy the sunshine and outdoor play. In this article, Val Mullally gives five practical tips on how to create a child-friendly garden. What’s the difference between “child-safe” and “child-friendly”? Safety is obviously important for your child’s sake – and creating a safe secure environment leaves your child free to play without unnecessary adult interference. What child wants a grown up saying – “Don’t do this/ don’t do that’” when they’re immersed in play! A child-friendly garden is always child-safe. i.e. no uncovered areas of water of any depth, no sharp corners that could cause harm. And a child-friendly garden takes into account the age and developmental needs of the child. A child-friendly garden will evolve as children grow. While some child-safe gardens will have little that attracts the child or holds interest for long, the child-friendly garden is a child-safe space that begs to be explored. 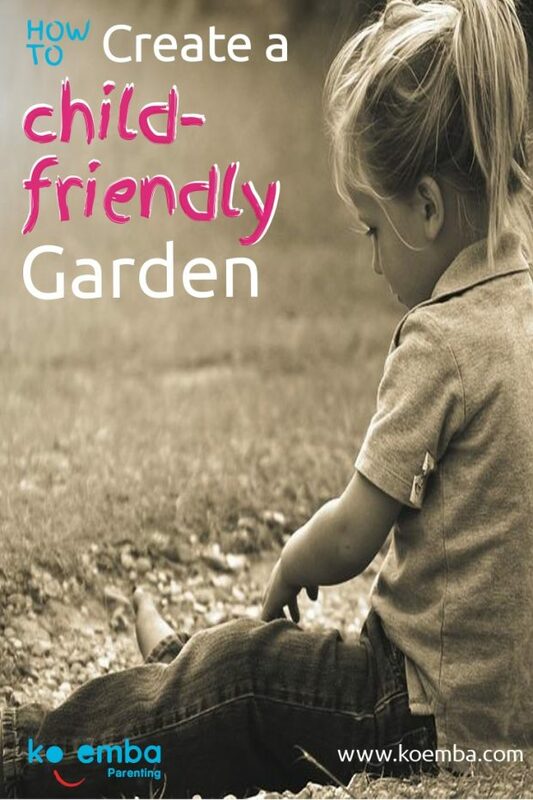 What is a ‘Child-Friendly’ Garden? 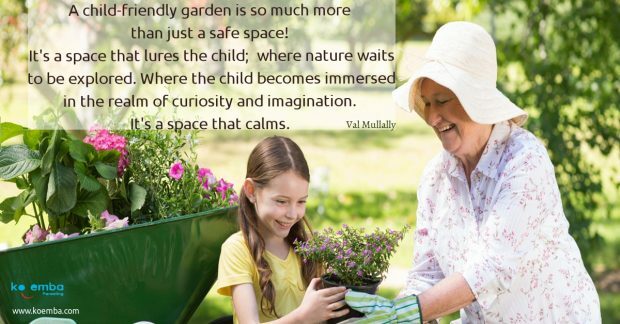 A child-friendly garden is something so much more than just a safe space! It’s a space that lures the child; where nature waits to be explored. Where the child becomes immersed in the realm of curiosity and imagination. It’s a space that calms. No matter how pretty, children don’t want a flat garden that is immediately available to the eye on first encounter. Children need somewhere the imagination can wander. A place where stories can come to life. A child-friendly garden is a place where there’s a sense of ‘magic’ – of mystery and wonder. A place where you can disappear into your own world of imagination – or wonder and curiosity, watching swaying leaves in sunlight, a bright ladybird on a leaf, or a bumblebee industriously collecting pollen. A place where you can create your own stories with your dolls or toy cars, where you can build a house for the hedgehog or fairy, or have a picnic or a tea party with invited guests (whether teddy bears, the child next door or mummy and daddy). Children love gardens that are rich in natural textures, where there are leaves that will blow in the wind, where the land has hillocks and undulations, and sunlight dapples through the trees. A garden where the child can lose herself in her imagination, where anything could be possible. It’s a garden where there aren’t such perfect flower beds that she can’t tumble and roll on the lawn. It’s ideally not one level surface. It’s interesting to the senses! A place that is attractive to all the senses – touch, smell, sight, taste, and hearing are all enticingly engaged. The warmth of the sun on grass and stones, the coolness of water and dappled shade, the sounds of wind-chimes and running water, the feel and smell of leaves, flowers and fruit, unexpected corners with new delights – these are all elements of a child-friendly garden. Young children can have endless hours of imaginative play in a garden like this. 1. Provide props to encourage play. For example, props for your children to create a picnic, or to make a ‘tent’. Sometimes children will ask for the props they need – but wise adults will also be sensitive to when something extra is needed. Maybe it’s a bottle of bubbles to blow, or a temporary ‘clothes line’ and pegs for a morning of washing dolly’s clothes, or an old sheet to make a tent. Farms, zoos and many adventures can be created with a few simple props. 2. Provide natural play materials. Natural materials like water, sand, mud, stones sticks and plants provide a rich sensory experience for children. Different weights, textures temperatures, smells, ways fo being used. Water play is a much-loved activity – but be aware of any safety hazards. A sand area is also great. Earth, mud, stones, wood, and water are all part of garden play. 3. Create a safe (and enticing) garden – and give them freedom in that space. Think back to your own favourite activities as a child. They were probably those times when you were free to create your own imaginative world, without an adult breathing down your neck. Young children need a child-safe garden with secure boundaries – and then give them space to create their own play, unless they’re inviting you to ‘join the party’. 4. Expensive play equipment isn’t needed. Many parents buy elaborate climbing frames and other playground equipment – but when you walk through a neighbourhood notice how many of these are hardly used. Rather create space that can be used in many different ways. The large pieces of equipment that are likely to give endless hours of pleasure are a good swing and a trampoline. (If you have young children, create a low boundary in front and behind the swing, so that younger ones won’t walk into the path of the swing). Children are far more likely to eat the healthy stuff when they’ve grown and harvested the food themselves! And there’s so much to learn – not only about the plants, but about the soil, worms and insects, watering, waiting for things to grow, tidying up after yourself, working together. Why do ‘Child-Friendly’ Gardens Matter? A garden is ideally a place where you can just ‘be’. A place where imaginations can bloom, where the senses can feast and muscles and brains can relax or be challenged in interesting ways. Even older children can experience a garden like this as a sanctuary – a place to be still and unwind. Where to Find Inspiration for A Child-Friendly Garden? Flower Shows are places where you can find inspiring ideas to bring the “magic” into your garden. Annual events like The Bloom Festival (Ireland’s answer to Chelsea Flower Show) are a fabulous outing and great places to get ideas on what makes a garden a place to nurture a child’s soul. To discover more about the Koemba Parenting approach buy your copy of ‘Behave – What To Do When Your Child Won’t’, available on Amazon in Kindle and paperback. Val Mullally shares some key insights about how to have a happy child (or be a happier parent) that she gained at an unlikely venue. What might a meeting of entrepreneurs have to do with raising a happy child – read on, because it was an unexpected surprise for me too! There was a great buzz in the upstairs room of The White Horse in Ballincollig Tuesday evening 19 April, as I and a group of other entrepreneurs chatted in anticipation of another inspirational evening hosted by Aodan Enright, founder and CEO of Smarter Egg. All of us who had previously attended one of these epic events knew we could expect a line-up of exceptional speakers. As the lights dimmed, a hush fell over the room. All eyes focused on Aodan’s challenging introduction, apart from a few like myself, who can’t resist tweeting about the buzz, while it’s red-hot happening. You may be thinking, ‘Val, what does this have to do with raising happy children?’ Well a lot, because the ‘red chair’ guest of the evening was Laurence McCahill @welovelean of ‘The Happy Startup School’. He promotes happiness in business. Such a fabulous concept it’s gone viral. And that gets me thinking – Koemba Parenting is all about more happiness in the home. Happiness is about love, fun, more smiles and living a beautiful life. A life worth living. But how? Here are a few thoughts from the Smarter Egg evening to inspire us as parents. A great vision for Parenting too! Laurence recommended ‘The Happy Movie,’ which has deeply impacted him and his message. Think about it. How do you choose to be today? Will your children remember you as ‘kind’? Before Laurence took the hot seat, Irish entrepreneur Colm O’Brien shared his amazing journey from a failed cafe to his thriving Carambola Kidz business, now providing more than 23 000 healthy school lunches in Ireland each day. But, the thing is, his message also focused on what matters in life – helping others; another key to creating happiness. Try writing out the quotes and thoughts that inspire you in this post and put these in key places where you’ll see them each day. See what happens! Contact Val on val@koemba.com for details. Other related posts: 10 Tips for Parents on Being Kind to Yourself .